New education technology is creating exciting learning and safety opportunities for classrooms and school districts in the United States. 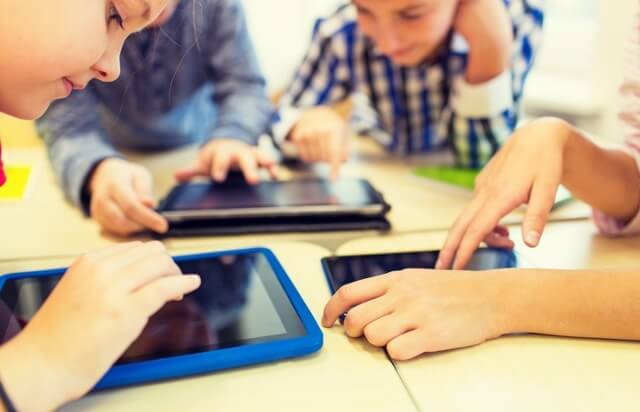 As new high-tech business capabilities are introduced in the marketplace, education technology is moving just as quickly to improve learning, safety, and operational effectiveness for K-12 students. From spelling bees to bus safety, the adoption of cutting-edge education technology is enhancing school environments in many ways. While it is not possible to predict which new tech will become a classroom mainstay, some startup projects offer a taste of the excitement ahead. Wearables go to school: Wearable tech once meant Fitbits and smartwatches. But wearables are for schools, too! A recent study estimates that the adoption of wearable educational devices will steadily increase by over 40 percent by 2020. Like other new forms of educational technology, wearables expand the boundaries of the learning experience. One new wearable is produced by Curiscope. The Virtuali-Tee interactive shirt pairs up students to study the human body and other subjects. As one student wears the device, another initiates an app on a device pointed at the other student. The edu-wear then allows users to explore the inner workings of the human body, either as a whole, or by zooming in on a particular organ function. Virtual reality (VR): Long predicted to have a big impact on commercial, consumer, and education technology, VR is now making its way into classrooms. With mainstream adoption, the cost of VR devices and systems will fall, making VR tech more affordable to school districts and parents at home. As could be expected, big competitors in the ed tech market include Samsung, Microsoft, Apple, and Google. Education tech from Oculus Rift gives students immersive experiences, piloting the first spacecraft to the moon on Apollo 11, learning about our solar system, or visiting the time of the dinosaurs. Another provider, Nearpod, offers extensive VR curriculum plans and resources to teachers. Operating across platforms, the tech does not require district participation if funding is not available, but also has the flexibility to be used by a single classroom. Tech partnering: The Scripps National Spelling Bee is one of the oldest educational competitions in the United States. Founded in 1925, the spelling bee now reaches approximately 11 million students each year in leveled spelling competitions. This year, the spelling bee is partnering with Amazon to offer their eloquent participants the opportunity to read spelling words from the official competition list in grade-level appropriate titles that can be downloaded on Kindle e-readers. The partnership allows students to read and understand spelling words in context — increasing their reading enjoyment, while strengthening their ability to spell difficult words selected especially for the spelling bee. Transportation technology: Advanced safety features make driving and riding a school bus safer. Electronic stability control (ESC) tech gives bus drivers added support when responding to inclement weather or traffic conditions. Designed to interact with the braking system of a school bus, ESC works to stabilize the vehicle and avoid the loss of driver control. The new tech offers other features too, including alerts and braking restraint in case an object or individual runs out towards the bus as it starts to move. Across the country, bus tracking apps like SafeStop give parents the ability to view the ETA for their child’s school bus, get instantly updated on any change in arrival time, and receive alerts about changes in pick up and drop off times in case of emergency. Delivering improved safety and operational cost efficiencies for school districts, SafeStop is ideal for giving parents real-time info on the whereabouts of their children as they’re transported to and from school. With advancements in educational technology, and affordable access to safety tech like SafeStop, the future of education is brighter than we could ever imagine.